If there was good news in the Q3 housing data from the U.S. Census Bureau, it was the rental vacancy rate, which dipped to 10.3% in Q3 from 10.6% in Q2 — the lowest level since 2009 Q1 and off the 2009 Q3 peak of 11.1%. 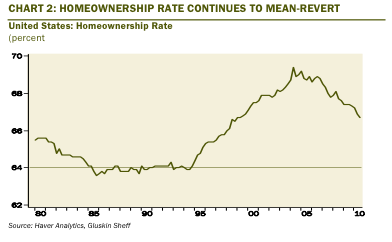 Meanwhile, the homeownership rate continues in its mean-reversion process — down four quarters in a row to 66.7% in Q3 from 66.9% in Q2. 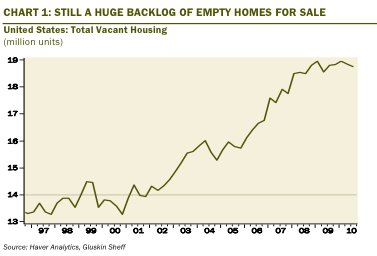 The cup-is-half- full crowd would point out that that we are now about halfway to the pre-bubble norm of 64-65%.